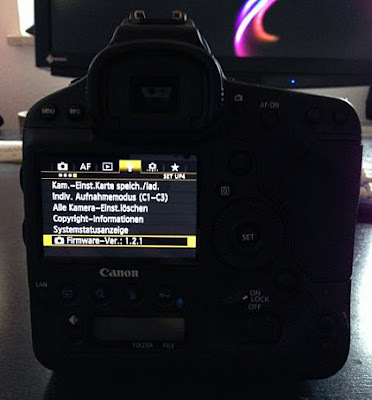 Canon is expected to release a new Firmware version 1.2.1, for their flagship camera, the EOS-1D X soon. I love this camera. You can take a look at my review here. We are releasing Firmware version 1.2.1 for EOS -1D X for service prior to the Web announcement. We are planning to make this firmware available on the Web for download in late January 2013.
photographers that the Image Selection button was pressed without realizing and the image size had been changed. Also, this firmware incorporates quality issue fixes that have been reported from the market. 1-1. The function to disable the Image Size selection button is added. 1-2. Fixes Err 70 and Err 80 which may occur depending on the camera settings, shooting scenes, or the timing of releases. Also, some complained camera freeze when Err 80 occurred. The above mentioned (1-2) phenomenon occur in very rare instances. In addition with the firmware update for 1-1, the fixes for these phenomena have been incorporated. In customization of operational buttons, there were errors in operational program for the exposure level display in the viewfinder when the Main Dial is set to change the aperture value in Manual mode, and may cause Err 70. Err 80 may occur depending on the distance to the subject, shooting scenes, or the timing of metering. This phenomenon occurs in very rare instances due to the error in operational program for metering when shooting a subject at a distance with telephoto lenses with focal lengths of 300 mm or 400 mm.